You who communes the secret supper, O brave lion. 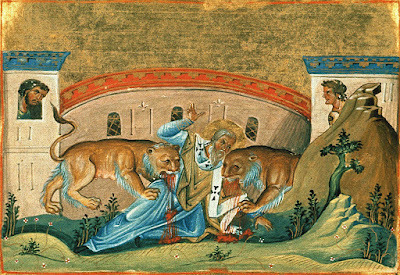 On the twentieth Ignatius died by the jaws of the lion. He was a successor of the Holy Apostles, being appointed as Patriarch of the Church of Antioch, second after Patriarch Euodios. 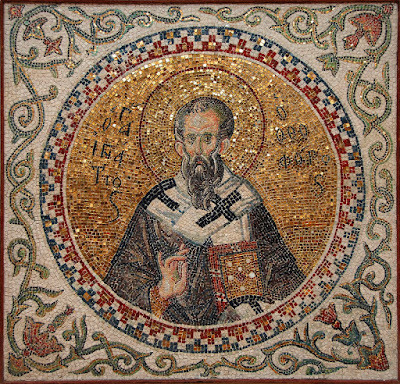 * He was a disciple of John the Theologian, together with Saint Polycarp the Bishop of Smyrna, in the year 109. When Emperor Trajan was to leave Antioch to go to Parthus, this great Ignatius was brought before him. And having conversed much regarding the faith of Christ, the emperor realized that his mind was unalterable. Thus the Saint was scourged with iron balls. Then spreading out his arms, he accepted the fire by them. After this his sides were burned with censers full of coal and smeared with oil. Then he was made to stand on lit coals and scraped with iron claws. This blessed Ignatius was that child,*** which the Master Christ while alive asked for, and grabbing and embracing him, said the following words: "Whoever humbles himself like this little child is the greatest in the kingdom of heaven. And whoever receives a little child like this in My name receives Me" (Matt. 18:4). It is for this reason that the Saint is called in an exalted manner "God-bearer". **** Our Holy Father John Chrysostom honored him with an encomium that begins "Sumptuous and splendid entertainers give frequent and constant entertainments." His Synaxis is celebrated in the most-holy Great Church. * Theodoret in his Dialogues says Ignatius was ordained Bishop of Antioch by the Apostle Peter. ** According to some sources, the lions devoured everything except the heart of Ignatius, on which by a great miracle was written in gold letters the name "Jesus Christ". 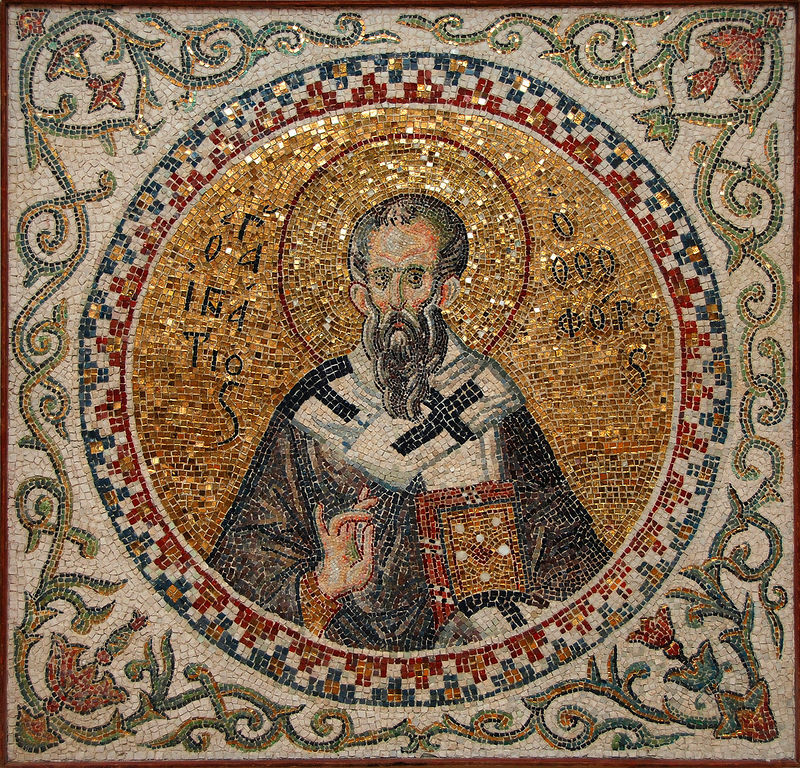 The translation of the relics of Saint Ignatius is celebrated by the Church on January 29th. *** Symeon the Metaphrastes and Nikephoros Kallistos say that Ignatius was seven years old when this took place. **** The name "God-bearer", according to Nikodemos the Hagiorite, should be understood in the passive sense rather than the active, since he did not bear God but God bore him up. Also, as God-bearer, it is understood that he bore God in his soul, and the name of God was written on his heart, as mentioned in note 2. Soaring with love for Him Who holds thee in His hands, thou wast shown to be a God-bearer, O Ignatius. Thou didst finish thy course in the West, and pitch thy dwelling in the unwaning day of the heavens. O Venerable Father, entreat Christ our God to grant us His great mercy. 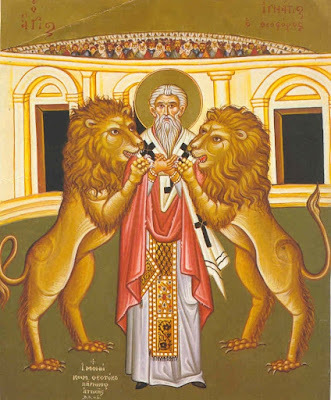 The Twentieth Day of thy glorious struggles, heralds the One to be born of a Virgin, for thirsting for His presence, thou didst hasten to be devoured by wild beasts. Therefore thou wast named God-bearer, O glorious Ignatius.